Traditionally, first responder organizations such as fire departments have been in the business of treating and simply transporting patients to hospitals – the most expensive place to deliver care. Beginning last year, the fire departments in five West Valley cities created the Community Paramedicine West Consortium, a system that is doing much more, producing improved results and reducing 911 calls, hospital transports and costs overall. In addition, these fire departments are connecting their paramedics to Health Current, facilitating better decisions in the field for treating and referring patients. 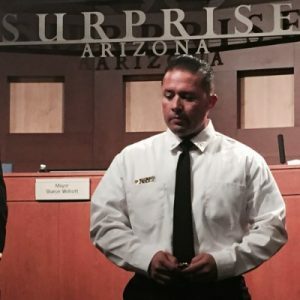 The fire departments of Surprise, Sun City, Peoria, Goodyear and Avondale formed the Consortium in 2015, with funding from the Vitalyst Foundation. Their aim was to examine frequent 911 callers and find ways to improve results and reduce 911 calls. One of the key tools in this effort involved connecting paramedics to Health Current in order to make better informed decisions and referrals in the field. The Consortium identified patients that had called 911 more than three times a month or more than 12 times a year, a total of 758 people. From that base, the Consortium reached out to callers to enroll them in a program where paramedics would make regular non-emergency visits to assess their home situation and identify the root causes of their frequent calls. These regular visits involve cases such as checking on diabetic patients to see how they are managing their diet, or “trip and fall” patients to assess and correct fall hazards in the home. This proactive outreach produced some outstanding results in the one-year pilot, according to Jesus Rivera, Battalion Chief of the Surprise Fire Department. Of the 158 residents who were enrolled in the program, 74 had accounted for 447 calls to 911 in the previous year. In the pilot program, these 447 calls were reduced to 54 calls between July 2015 and June 2016. One frequent 911 caller was an 85-year-old patient who had experienced many falls and was often angry and confused upon the responders’ arrival. On one visit, they found that the patient was unable to perform simple daily tasks on his own. When they viewed his history in the HIE, they found that he had been diagnosed with Alzheimer’s. Although he didn’t show acute symptoms requiring emergency treatment, the paramedics used the HIE information, along with their observations to make the decision to transport him to the hospital. Later, they found that the patient was suffering from a urinary tract infection which could have led to sepsis if left untreated. Another frequent caller was a male patient in his late 30’s who had been taken to the hospital multiple times. His medical complaints typically included pain in his arms and legs as well complaints of dizziness. Access to the patient’s history in the HIE, however, showed that behavioral health issues were an underlying cause for his frequent visits to hospital emergency departments. With this information, the paramedics referred the patient to his behavioral health provider where he was able to get the care that he needed. Paul Luizzi, City of Goodyear Fire Dept. 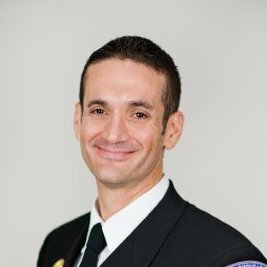 Paul Luizzi, Fire Chief of the Goodyear Fire Department has seen tremendous benefit from their connection to Health Current. His paramedics are actively engaged in the AHCCCS Treat and Refer program and he calls their HIE connection an “incredible resource” in determining where to send patients. “Our staff feels as if we are social workers but responding in the field in emergency situations, and we can take every resource that we can get,” he said. The five fire departments in the West Valley have been in touch with fire departments around the state and others are following their lead. Health Current now has 12 first responder organizations participating in the HIE.